The blackberries this summer are unusually delicious: sweet, massive, and very juicy. We picked up a few extra at the farmer's market this weekend to make into a breakfast topping. The French Toast recipe is one we've adapted from Betty Crocker. First, heat up your griddle to 375°F. 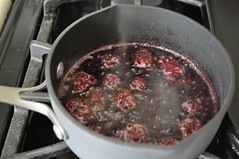 While that's heating, bring the berries, sugar and water for the syrup to a boil in a small saucepan. Once it's boiling, continue to boil and stir frequently until the mixture is reduced by about half. (While they cook, the berries will turn bright red, then begin to melt into the syrup -- no need to crush them.) Once reduced, let the syrup cool to just above room temperature. As you boil the syrup, whisk together eggs, milk, sugar, vanilla, salt, and cinnamon in a shallow bowl. Beat until smooth. Lightly grease griddle with butter. Gently and briefly dip bread into egg mixture, being sure to coat both sides generously, but don't let it soak in. 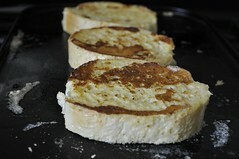 Place on griddle -- keeping any excess on the bread will make the toast hearty. Cook for about 4-5 minutes on each side, or until golden brown. 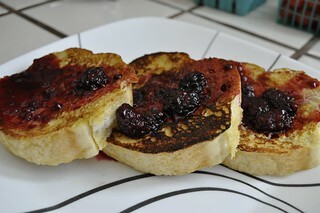 Finally, the best part: plate the toast and drizzle the slightly cooled syrup onto the warm slices. Spoon the cooked berry chunks on top and enjoy.